Operation Blücher proposed a three-army attack along the Chemin des Dames: another frontal offensive, this one across the same terrain that had contributed so heavily to the French debacle in 1917. Ludendorff nevertheless approved as a means of drawing French reserves from a British front that he still expected to rupture decisively somehow at some future time. Mounting Blücher required the transference of significant infantry and artillery from Rupprecht’s army group. Even then German strength was insufficient to replicate March 21 with a single coordinated attack. Results would have to be sought in a sequential series of attacks. That meant in essence using the same resources again and again, shifting their positions rather than relieving them to rest and prepare for the next round. Blücher succeeded in replicating Michael in the secrecy of its preparations—aided, according to some accounts, by the nightly croaking of thousands of frogs in the marshes and on the river banks. Thirty-nine divisions, two-thirds of them assault formations, were available. If the number of guns was fewer than optimal, Bruchmüller was in charge of them and supplemented tube artillery with over twelve hundred trench mortars. The Allies were taken by surprise when the German barrage, three million painstakingly coordinated and devastatingly effective rounds, opened on May 27. To make matters worse, the French sector commander insisted in front-loading his positions, at the rate of one division per five miles of front-line trenches. Finally, the initial weight of the attack fell on four British divisions badly mauled in the earlier fighting and sandwiched into this quiet sector to recover. Tactically the attack was a virtuoso performance, even compared to Michael. Planning and serendipity enabled the Germans to advance as much as fourteen miles on the first day—the war’s largest single-day ground gain on any front. As the offensive attack continued to progress, Ludendorff applied the by now shopworn principle of following up tactical success with a set of operational objectives as vague as they proved ephemeral. He wrote of threatening Paris. Instead, Blücher devolved into an offensive to nowhere in particular as Allied reserves shored up the line and exhausted, disgruntled Germans found solace in captured supply dumps and their stores of liquor. Material results were impressive: 127,000 Allied casualties including 50,000 prisoners; 600 guns; an advance of almost forty miles in four days. But the vital northern French railway network was still uncut, its centers uncaptured. Blücher and its subsidiary operations had cost over a hundred thousand Germans dead, wounded, missing—replaceable in neither numbers nor quality. And a new player was making an appearance: the American Expeditionary Force (AEF). The improvised American Army had the obvious and predictable shortcomings: inadequate training, ineffective equipment, inappropriate doctrine, inefficient officers, inflexible organizations, inexperienced men. Two further factors exacerbated the Yanks’ initial difficulties. One was the strained relations between the Americans and their war-experienced mentors, the French in particular. A sense of saving the day at the last minute reinforced frequent dismissal of the poilus as burned out, prone to panic and reluctant to fight. In fact, as German casualty lists attested, the French remained on the whole first-rate combatants, skilled alike in minor tactics and larger combined-arms operations, making up in craft what they had sacrificed in élan. The confidence of inexperience limited the Americans’ ability to benefit systematically by observing their veteran allies. And that inexperience was red meat to the Germans who faced them. In the “little war” of patrols, raids, and small-scale attacks that characterized the Americans’ early tours on the front line, the Germans consistently set the pace in battlecraft, initiative, and effective courage. The Americans were more than willing to fight. They simply did not know how, even against the third- and fourth-rate German divisions holding down the relatively quiet sectors that were the AEF’s test beds. The AEF’s higher commands and staffs were no less caught up in the higher mechanics of combat and logistics on scales heretofore unimagined at West Point or Leavenworth. The divisions were on their own. From Seicheprey and Château-Thierry through Belleau Wood to Soissons, Americans learned by experience, observation—and sometimes pure serendipity. Their learning curves could be steep, but too often the lessons learned were in a context of two steps forward, one sideways, one back. Their tactical deficiencies remained: poor cohesion and worse liaison, ill-defined objectives, misplaced initiatives. Their casualty rates were swingeing—on the scale of 1914–15. Too many officers in too many positions were still not up to their jobs. Tactical cooperation with the French was, if anything, growing worse. Nevertheless, the doughboys passed their first tests with credit, given where they had begun eighteen months earlier. They would play significant roles in checking the final German offensive and the resulting Allied counterattacks. That, however, lay in the future. Present reality was Ludendorff’s reaction to the huge salient Blücher had created. Almost forty miles across, over sixty miles long, difficult to defend and more difficult to supply, it offered a stark choice as either a magnet for a major Allied counteroffensive or a springboard for another German attack. An initial effort in early June failed for the first time in months to achieve anything worthwhile tactically, to say nothing of operationally. The Allies were increasingly able to cope with storm troop tactics. 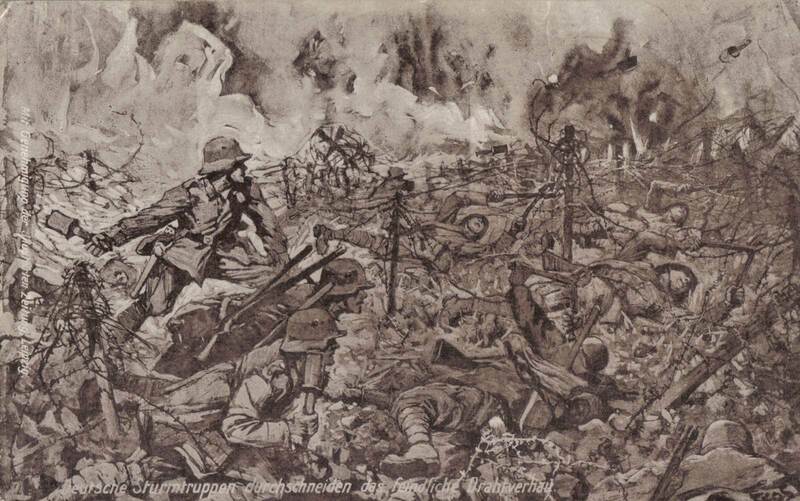 The storm troop principle of infiltration, bypassing strong points in the way water seeks the easiest path, led to a downward focus that negatively complemented Ludendorff’s strategic principle of “punching a hole and seeing what happened.” In both cases there were no objectives—just processes, ultimately leading nowhere in particular. The result, as casualties mounted and reinforcements dwindled, was the reduction of assault divisions and storm battalions to isolated combat teams that could be frustrated, destroyed—or stopped in their tracks. At command level, Ludendorff’s next operational decision was easily made: an attack towards the Marne, with the initial objective of—finally—capturing the railroad hub of Reims, and with Paris on the horizon as a prospect. 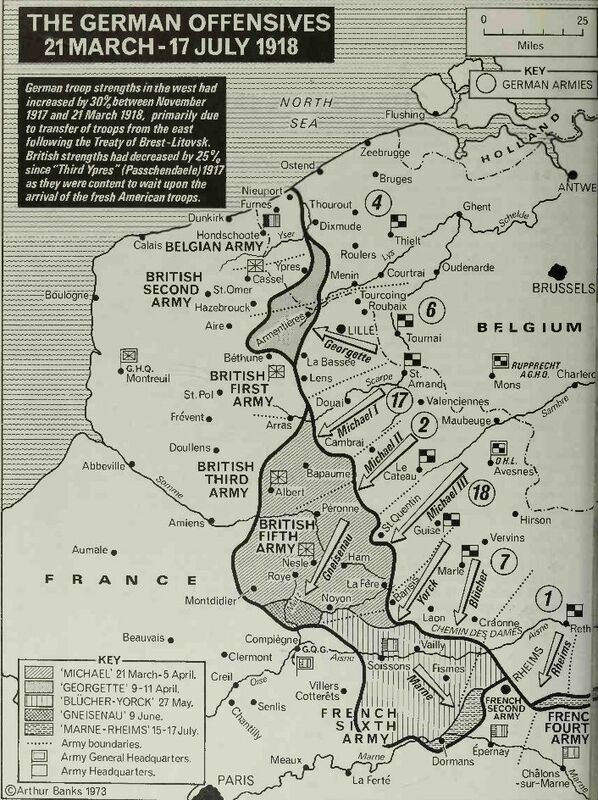 There were more or less vague thoughts at OHL about using this offensive as a preliminary to a final, decisive blow against the BEF in Flanders. But what the Allies called the Second Battle of the Marne had first priority. If this was not an all-or-nothing effort, it was as close as the German Army could come. Forty-eight divisions, 900 aircraft, 6,300 guns, and Georg Bruchmüller were committed to the attack that began on July 15. This time the initial successes were limited, the offensive was stymied, and a series of well-coordinated Allied counterattacks retook almost all the ground lost during Blücher. Lossberg, a supreme realist and sufficiently junior to escape the predictable consequences, set the war’s “precise” turning point as July 18: the first day of the final Allied offensive on the Western Front. There might be errors and misunderstandings along the way, but from that date the Allies never looked back and the Germans always fought on the back foot, ever closer to home. English-speaking historians remain prone to give the palm of decisive victory to the BEF’s attack on August 8, “the black day of the German Army” according to Ludendorff. It is more accurate to credit the empirical British with developing the first modern combined-arms team: a doctrinal, institutional, and technological synergy among infantry, artillery, tanks, and air power, coordinated by radio systems. The artillery sealed the flanks of an attack, conducted counter-battery fire against German gun positions, and provided an initial creeping barrage. Within the “artillery zone” the tanks sought targets of opportunity while the infantry probed for soft spots, each supporting the other as needed. Aircraft provided reconnaissance, artillery observation, and, increasingly, ground support: by August 1918 the Tank Corps had an RAF (Royal Air Force) squadron attached. The complex interaction of these arms could not be controlled in any modern sense with the communication technology of 1918. Radios, still bulky and unreliable, were impractical below brigade level. Above all, even in the war’s final stages, technique and technology could not significantly reduce casualties. The Third Republic had the doctrine and possessed the tools for modern combat. French staff officers proclaiming “the battle of 1919 will be a battle of aviation and tanks” were, however, less expressing principled conversion to high-tech war than recognizing that their army had finally run out of men. By the time of the Armistice, “the emptiness of the battlefield” was more than just a metaphor in French sectors. The Americans were still chewing their way through the Argonne Forest on what amounted to a rifle-and-bayonet basis, suffering in under seven weeks the largest number killed of any battle in America’s history. They learned as they died, impressing the Germans with a fighting spirit long since eroded in their own ranks. But the AEF was still a long way from being able to implement smoothly the “semi-managed” battle, with attacks only able to move forward in a lurching progress that grew steadier with practice. It is similarly appropriate to speak of a “semi-mobile” battle, with men, vehicles, and firepower pushing back the German front as opposed to rupturing it. The initial gains of August 8 were in a sense deceptive. Neither the tactics nor the technology of 1918 was quite up to breaching even improvised defensive positions at acceptable cost. What they could do was maintain a steady pressure that compelled an eroding army to fall back steadily, never giving it time to recover. Relative to its opponents, moreover, the German Army was demodernizing. The Fokker D-VII had acquired a reputation as the best fighter on the front, but the Jagdstaffeln were being whittled down by growing Allied numbers and increased Allied skill. A new generation of French and British air superiority fighters was coming from the factories to the front. Manfred von Richthofen had been killed on April 21, probably by ground fire. By mid-August his famous Fighter Wing 1 had been consolidated into a single squadron due to its heavy losses, the first of several times it would similarly be bled white. In May and June alone the Luftstreitkräfte used twice the amount of fuel that reached the front, and subsequent introduction of rationing limited some fighter squadrons to ten sorties a day. Whether a unit was fighter, attack, or observation, old hands carried the main burden and were making fatigue-related mistakes that too often proved fatal, even with the episodic introduction of parachutes in the war’s final stages. On the ground, the few tanks available achieved nothing in particular. Their numbers were too limited. Their technical shortcomings were too many. The overhanging chassis was vulnerable even to slight obstacles and irregularities. In operational contexts, officers of other arms had no serious idea of what tanks should or could do. Nor, indeed, did the tankers themselves. Armor doctrine, insofar as it existed, emphasized maintaining close contact with the infantry, using surprise when possible, avoiding rough or heavily shelled terrain. On one occasion a single cannon-armed A7V prevailed against no fewer than seven British Whippets carrying only machine guns. On another, the tanks encountered a river reported as fordable that in fact proved too deep to cross. On a third an Abteilung of A7Vs drove into an artillery position and was constrained to beat a hasty retreat. It was a far cry from June 1940. More prosaically, artillery horses were dying in their traces by the score, limiting when not crippling the guns’ mobility, increasing the problem of providing effective fire support in what was becoming increasingly a war of movement. The deeper penetrations Allied tactics and technology enabled not only left more front-line units isolated, but made retreat an increasingly high-risk option. The result was a growing number of “ordered surrenders.” Three hundred forty thousand German soldiers surrendered between July 18 and November 11, 1918. These were mostly group capitulations, organized by company officers or senior NCOs, often brokered in part or accompanied by providing detailed information on a sector’s defenses and strong points as a good will gesture and to avert any later misunderstandings. It was a long way from August 1914. The Germans’ fighting retreat was predictably tenacious and predictably skillful. They inflicted more casualties than they suffered. But in David Zabecki’s words, “they were truly burned out.” Hunger, influenza, typhus, and traumatic stress shredded the ranks at the front and in the rear. By default it was becoming an infantryman’s war that the infantry could not sustain indefinitely. Over 400,000 more men were dead or wounded. More ominously, almost 350,000 were counted as prisoners or missing. By early October an army corps with seven divisions in its order of battle was reporting its infantry strength at less than 5,000 men—less than 10 per cent of authorized tables of organization. One regiment could count only 200 men. Another mustered 120, organized in four companies instead of the regulation twelve. Units with such low strengths fell far below the critical mass necessary to sustain cohesion as a combat force. Battalions and companies depended increasingly and disproportionally on the remaining alte Hasen and the Korsettenstangen, the “old hares” and the “corset stays”—the machine gunners in particular—that the front’s artisan groups continued to produce. But as summer gave way to autumn the combat effectiveness of these groups eroded in favor of their survival aspects. Getting home alive became a primary objective of the Korporalschaften that in the course had become Kameradschaften as well as Kampfgemeinschaften. Wilhelm Deist describes the result as a “camouflaged strike,” with the “proletariat” of the war machine downing tools in a Marxist model of behavior. One might refer as well to Robert Darnton’s model of pre-industrial protest: challenging a system by defying its norms. Even before the army fell back towards its own frontiers, its rear areas contained increasing numbers of men who had drifted away from the front war. The will to enforce more than the minimum forms of discipline eroded, less from fear of a bullet in the back than a sense that it no longer mattered. The German Army did win final victory—over its own government. Since August Ludendorff’s behavior had grown increasingly erratic. He blamed the continuing sequence of defeat on the failures of subordinates. He insisted deserters be executed out of hand and officers enforce orders with handguns. He had not, however, entirely lost touch with reality. On October 1 he presented a general review of the military situation. The war, he declared, was lost. The only way to save the army from disaster was for the government to request an immediate armistice. His auditors broke into fits of sobbing as the quartermaster-general finally confirmed the long-standing aphorism that “Prussia was an army with a country.” Two days later, Prince Max von Baden became chancellor. His first official act was to request an armistice on the basis of Woodrow Wilson’s call for “peace without victory.” He received a dusty answer. Wilson demanded that any terms make German resumption of hostilities militarily impossible. He insisted on refusing to negotiate with the emperor and the generals. The protests of Ludendorff and Hindenburg amounted to spitting into the wind. William’s last imperial act was to replace Ludendorff as first quartermaster-general with Wilhelm Gröner. It would be Gröner the problem-solver who would negotiate William’s abdication as the Second Reich collapsed into mutiny and disorder in a matter of days. It would be Gröner who silenced the fire-eaters demanding an all or nothing end game on German soil. And it would be Gröner who arranged the compromise with an embryonic republican government that committed the army, what might remain of it, to maintain law and order if the republic restricted revolution to the political sphere. Those, however, are stories for another time and another book. The generals’ rebellion that deposed the emperor and the domestic revolution that ended the monarchical order are alike remarkable for the limited influence they exercised on the army as an institution. Conscript national armies are held together by a complex interface between front and home, military system and civil society, incorporating varying combinations of compulsion, patriotism, and ideology. Underlying all of them, however, is an implied contract between the soldier and the system. When the nature or the conduct of a particular conflict breaks that contract, soldiers are likely to respond negatively. To speak of a “strike” is to minimize the emotional factors, especially the sense of betrayal that accompanies the process. One might be better advised to talk of alienated affection. By November 1918, the German High Command could count no more than a dozen or so of its divisions as able and willing to fight anyone. Its storm troop battalions were increasingly used as headquarters guards. Far from being “stabbed in the back,” the German Army was beaten in the field, beaten to a degree sufficient to break its social contract and erode its cohesion. For the most part, the desires of the disaffected soldiers were expressed in the counterpart to a joke common among American GIs in World War II. A suitably edited version is “when I get home, I’m going to do three things. First I’ll have a beer. Then I’ll make love to my wife. Then I’ll take off my pack.” Such a mind-set may not make revolutions, but it can halt wars. The Imperial German Army ended its existence with a collective sigh of relief.